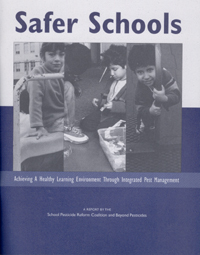 Safer Schools: Achieving a Healthy Learning Environment through Integrated Pest Management is a 60-page report that documents the IPM practices of 27 school districts in 19 states. Published by Beyond Pesticides and the School Pesticide Reform Coalition, it contains an in-depth look at the history, policies, implementation, costs/benefits and keys to success and expansion for each school district. The report also includes a how-to guide to help schools to adopt IPM programs, a list of school IPM contacts, a list of states that have IPM or pesticide policies and a 2-page IPM checklist for schools. Copies are available from the IPM Institute or Beyond Pesticides for $5 each, including shipping and handling. To order, contact the IPM Institute or email Beyond Pesticides or call 202-543-5450. For more information, visit the Beyond Pesticides website at http://www.beyondpesticides.org/main.html. Pest Management at the Crossroads, written by Charles M. Benbrook and others, presents viable, currently available alternatives to high-risk, chemically dependent pest management strategies. The book details the threats chemicals pose to people and the environment, examines costs and benefits of pesticide regulation and documents successful IPM programs. Published by Consumers Union in 1996, copies of Pest Management at the Crossroads are now available for $12.50 each, including shipping and handling, from the IPM Institute. 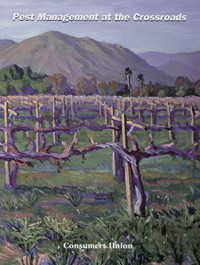 For more information on the book, visit the Pest Management at the Crossroads website at http://www.pmac.net/.